With the 2018-19 campaign into the home stretch and his side top of the Jupiler League, it’s perhaps puzzling that former KRC Genk captain Alejandro Pozuelo chose now to leave the Belgian club in favour of a move to MLS. However, that is exactly how things have transpired, with the 27-year-old midfielder currently in the process of formally completing a shock mid-season transfer to Toronto FC. Sunday was supposed to be Pozuelo’s farewell appearance for Genk but the Spaniard was laid low by as bout of illness and was therefore unavailable for the match against Zulte-Waregem on Sunday. Angered by the manner in which Pozuelo engineered his departure, the jilted Genk fans decided to make their feelings plainly known in his absence. 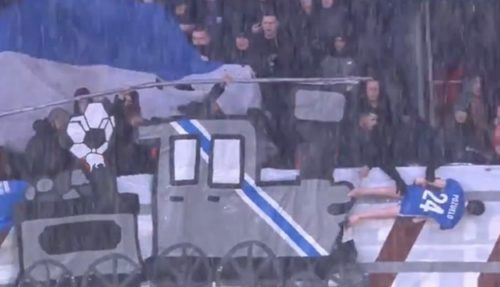 The result was a macabre tifo in which an inflatable dummy bearing Pozuelo’s name and number was hanged from the upper tier of the stadium for several minutes before being ‘run over’ by a cardboard train. The whole thing was quickly spotted and removed by stewards but not before the resulting footage and photos had made it to social media. Genk have yet to comment. All a bit reminiscent of the giant, similarly gruesome banner unfurled by Standard Liege fans which depicted Steven Defour being beheaded after signing for rivals Anderlecht in 2015.